So many of these articles are about new places and our impressions of them as unfamiliar visitors. But it’s our common haunts that we take for granted, and which we sometimes need to appreciate a little bit more. This article is about not only a place very special to me, but a person. Our friendship began when, at thirteen years old, I decided to chase him across the school field. In hindsight, it was a fabulous decision. He is my best friend, my PICF (Partner in Crime Forever, an acronym conceived at a similar time to the friendship), and very few people in the world mean as much to me as he does. When I think of him, I think of us trying to catch each other off guard with Rik Mayall impressions; singing “El Tango de Roxanne” into the wind, arms outstretched and hair knotted; seeing Armstrong and Miller live and admiring their bald patches from the upper circle; chasing him across Trafalgar Square, trying to steal his map whilst doing my horrifying Mrs Krabappel laugh. Warm, calming memories – but we share many more than just those, and a lot of them were created at West Park Nature Reserve. Bradley first took me there when were in Year Ten. It was for an art project, where we had to collect twigs and leaves and draw the landscape in coloured pencil. The ground was sodden with rain. He fell over three times, mud streaked up his legs like Marmite. I think he hated it. But despite that, and despite me still mocking him for it, he continues to take me back there. We always enter the woodlands first. The ferns are overgrown, and they brushed against my forearm as we walked. They’ve engulfed the rock where we always take a photo to commemorate each visit, and we have to clamber up a slope woven with tree roots to reach it. Further along is what we fondly named ‘The Pose-y Stump’, a sawn off tree trunk where I always insisted he photographed me when my teenage narcissism was at a high – now I only do it when my early twenties-narcissism comes calling. But the woods is only ever a beginning, a starter, a prologue. Because through a gate and across the road, the wind rippled the lake water. We always walk counter-clockwise around it, stumbling up the cut-stone steps and tripping over brambles on the way back down. There’s a cave where we paddled about in the stagnant water in our wellies, fascinated by that bizarre feeling of cold-but-dry feet, and inventing stories of how the abandoned oven managed to find its way there. We climbed up the rocks and sat down, and I traced my finger over all the names and initials carved into the grey stone. Did they think of me when they did it? The stranger, years later, rolling their names around in her mouth like a boiled sweet. Bradley stood too close to the edge. I told him off. He responded by sitting down and swinging his legs in the empty air. Across the water, we saw a group of youths sitting in our favourite spot. We cursed them, how dare they, and waited. Finally, the spot was ours, and we laid down my blue picnic blanket and placed a feast on top. Smoked cheddar sandwiches, black pepper crisps, strawberries and cream cakes. We played Boggle Slam, and added our own flare to the lack-lustre rules while smearing strawberry juice over the cards. Bradley tried to argue that Flig is a word. I allowed it. The crisps were hot, and I whimpered as the spice poked at my mouth. I abandoned them for a while, downing squash a little too eagerly, returning to the crisps only to discover that ants had crawled into the packet, their dark, fat bodies difficult to distinguish against the black pepper seasoning. I risked it anyway, continuing to nonchalantly nibble at the broken remnants, trying to select the pieces that didn’t appear to wiggle. Bradley perched on the edge again, and tentatively, I joined him. We swung our feet in unison, and stared down at the ducks and the lily-pads. 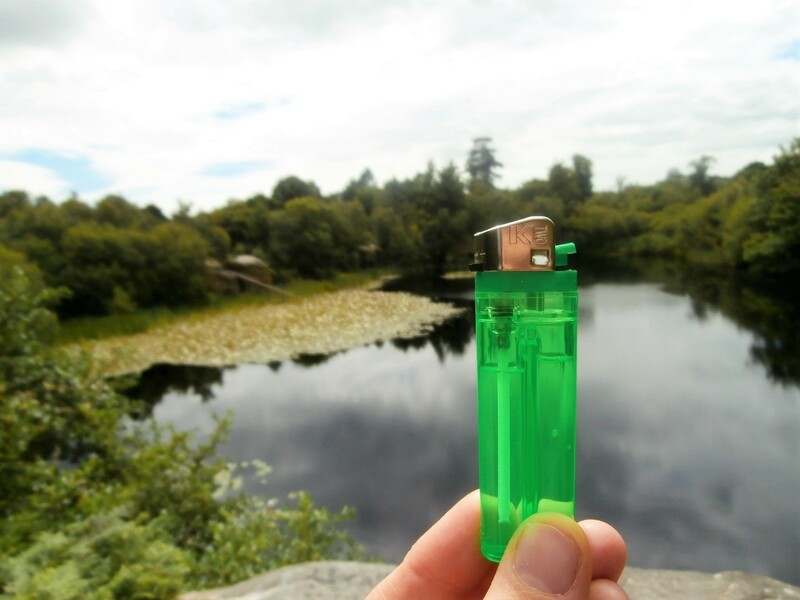 I slipped my lighter from my pocket and took my photo. Green, the shade of the leaves all around – and of his jealousy as he pleaded for a go with the camera. To me, the true measure of friendship is minimalism; taking a simple place and simple things and letting one’s fondness for each other grow naturally.